You don’t need a chimney to be able to enjoy the cosy feeling of cuddling up by the fireplace! Whether it’s because your home isn’t set up for a wood burner, or you just love their convenience, the advantages of buying an electric fireplace are plenty. If you are looking to heat up your home this year with a new electric fireplace, you have come to the right place! 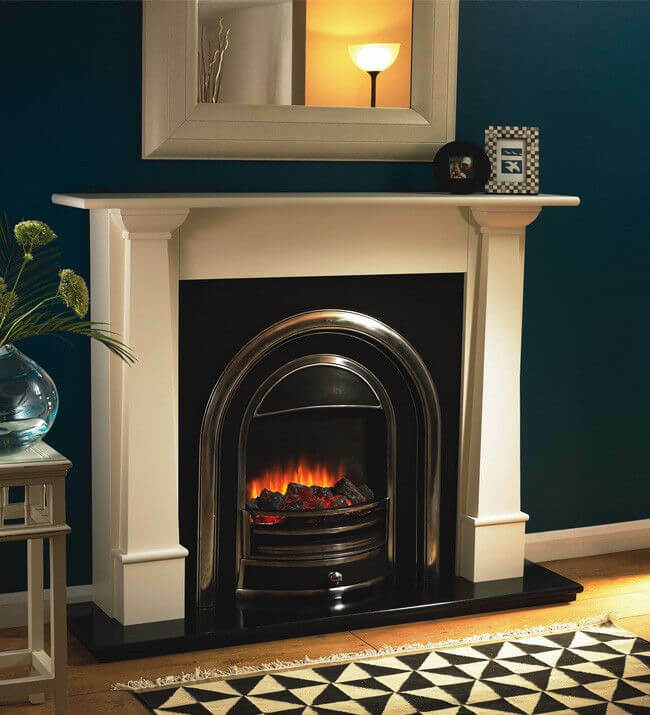 Here at Direct Fireplaces, we stock one of the best ranges of fireplaces for all needs, so you can find the perfect one for your home. Electric fireplaces have come a long way, with innovative technology making them look more realistic and impressive than ever before. And, with sleek and clean lines, they are the perfect addition to a contemporary room. The Celsi Ultiflame VR Avignon Electric Fireplace Suite and the Celsi Ultiflame VR Callisto Electric Fireplace Suite both feature striking Ultiflame VR fires. Using ultra-realistic virtual flames with a ceramic log fuel bed, the 3-D effect really captures the effect of an authentic fire. To add to its contemporary appeal, it also comes with a remote for thermostatic control, allowing you to easily adjust the heat and look of the flames. 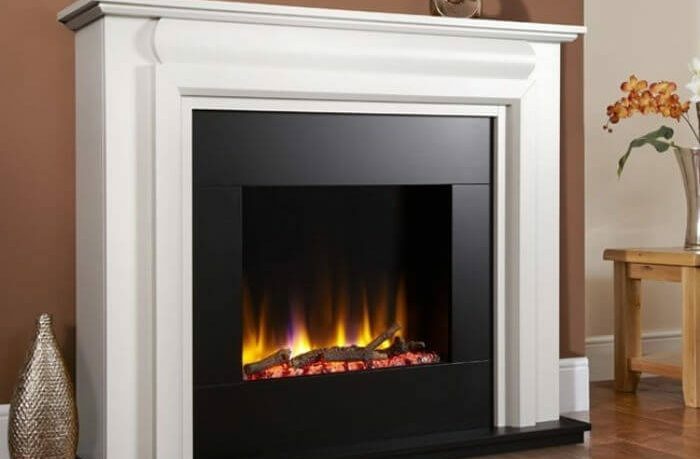 You can find out more about the best realistic flame effect fireplaces here. You can enjoy the beautiful effect of the Ultiflame fire with one of our stunning fireplace suites mentioned above. 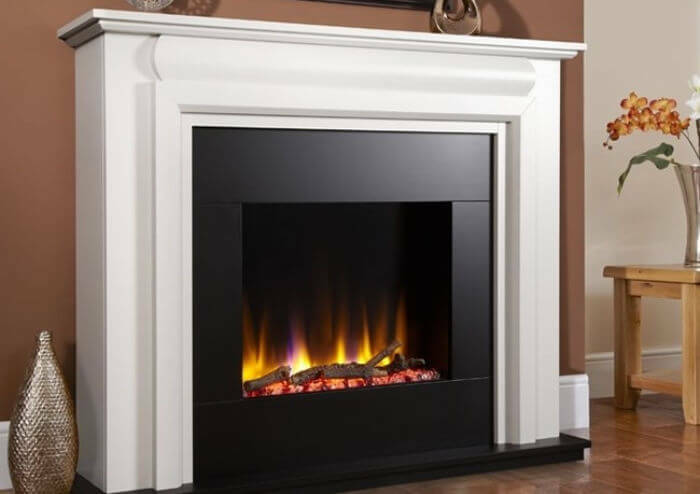 The Celsi Ultiflame VR Avignon Electric Fireplace Suite features an elegant limestone surround that really shows off the flames within, while the Celsi Ultiflame VR Callisto Electric Fireplace Suite is painted in a choice of three stylish colours to match your room. While electric fireplaces are the most modern type of heating, it doesn’t mean you can’t get a traditional look. The Flamerite Bronte Electric Fireplace Suite combines all the mod cons of an electric fireplace with the charm of an old fashioned fireplace. Using state-of-the-art LED technology to produce a 3D-effect flame effect, this fireplace flickers just like the real thing. It is also available with either a coal or log style fuel bed so you can get exactly the look and feel that you want. With a stone-effect mantel and dark granite hearth, the classic metallic trim adds a traditional twist to this stunning fireplace suite. One of the biggest benefits of electric fireplaces is how quick they are to set up. Even on a budget, you can easily find an electric fireplace that you can simply plug in and get going without having to carry out building work. What’s more, you won’t have to sacrifice on appearance. 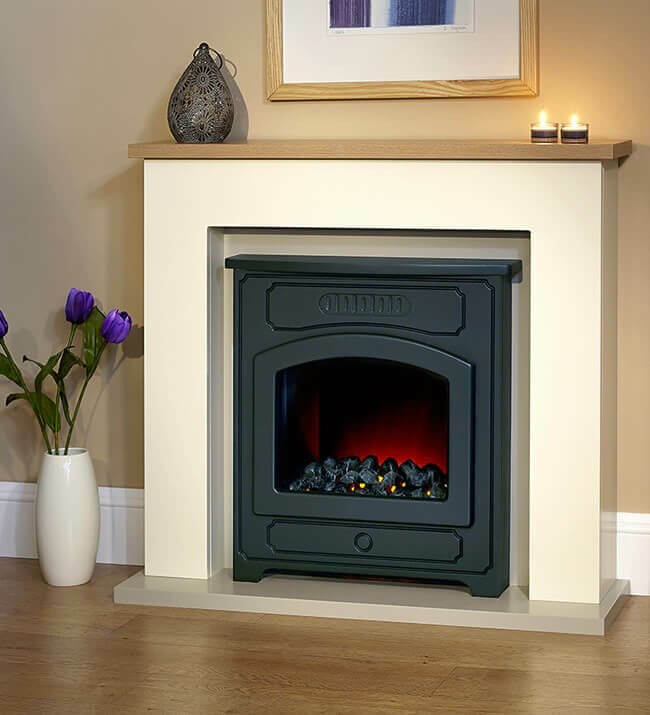 Our Suncrest Thornton 37″ Electric Fireplace Suite features a lovely stove fronted electric fire sitting within a stone effect surround and hearth topped with an oak effect shelf for a timeless appearance. With LED flames that can be used independently of the thermostatically controlled fan heater, this fireplace suite offers fantastic value for money. Our fantastic range includes an array of electric fires and electric fire suites, so be sure to check out all of our products to find your perfect electric fireplace with free delivery. Thanks for your question! Our Direct Fireplaces showroom is located in Stockport. However, you can contact us for advice on 0161 376 4181 any day of the week from 9am to 5.30pm, or send us at email at sales@direct-fireplaces.com. We offer free delivery to most parts of the UK, too.